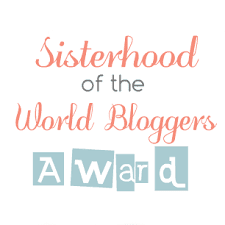 The rules are to thank the blogger who tagged you, answer the questions left for you, make 10 new questions, tag 10 other bloggers to do the award and put the logo somewhere on your blog. My biggest pet peeve would have to be arrogant/cocky people. Now I know I've said it before but I can't stress enough how much it bothers me! 2. If you could change anything in your life right now, what would it be? Ah, this is a hard one but I'm going to have to go with the time that I was in a public restroom about ready to wash my hands and a woman kindly points out that I had toilet paper hanging out of my pants *face palm*!! 4. What is something no-one knows about you? I had to think about this one and I'm not sure if this is really a good answer but I tend to turn everything into a song or dramatic performance. I've always loved the idea of being in a broadway musical or acting and so I like to take my chances when I see them. And I only ever do this around my family because that's who I'm most comfortable around so technically not a lot of people know about this. 6. 1f you had $1000 to spend, what would you buy? 7. What is your favourite colour to paint your nails? Maroon colors are my favorite. I recently got a dresser that has a big gap where I can store some of my stuff and it has a little board that pulls out where I can place my laptop or food when I'm eating and I like to think of it as my little office. 10. What is your biggest hope/dream that you want to accomplish? I've always wanted to be in the movie business. Whether that be that I am a director, an actor, an editor, a set designer, a talent agent, you name it. I've just always been so interested with behind the scenes stuff and it would be my ultimate goal to work in a place like that. If we're talking big dreams then I want to work for Ellen!!! * As always you are not obligated to do the tag :) and if you've already been tagged; the more the merrier right? ;) haha but you are also not obligated to do the tag again. 1. If you could only attend one concert for the rest of your life but you got to choose the artists that performed, which 5 artists (bands count as one) would you want to see? 3. What song is stuck in your head right at this moment? 4. If you could go back in time to fix any mistake what mistake would you fix? 5. If there was one thing you can do right now at this moment regardless of money what would you do? 6. If your life was a movie what movie would you want it to be? 7. If you could be the lead role in your favorite movie, what movie would you like to act in? 8. *I came across this on tumblr yesterday and I didn't really get the name of the blogs who posted this so I looked it up on google and it seems that it was (I-amwho-I-am and I couldn't find the second person's blog name)* so this question was not mine but I'm so curious to see what you have to say!!! 10. If you were given the chance to go on a date with your celebrity crush who would you choose? You're welcome :) and thank you! for tagging me haha I really love the tag I can't wait to do it. Perfect post I love it!! Follow for follow? Let me know, I follow u back!! Have a great week and thanks again for thinking of me!! Aww!! :D <3 Thank you Leja I enjoy reading your posts as well :). It can be hard because I mean it's impossible to just completely ignore them all the time, but just know that you are a beautiful and amazing person <3 Your welcome!! :D If you get around to doing the tag I can't wait to read your answers! Congradulations! I loved the gif, I'm watching Supernatural right now! I'm working on not caring what people think too, but I am an over thinker.